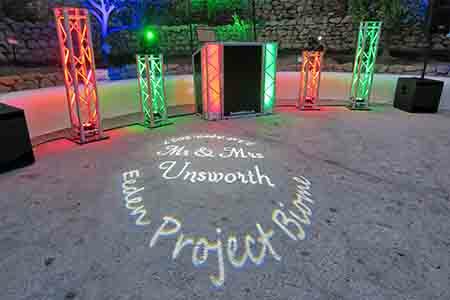 For almost every event we do, we usually make a special customised monogram gobo just for you and we use a gobo projector to project this image on to the dancefloor, a wall or ceiling. It will usually include the date, Mr and Mrs, Mrs and Mrs, Mr and Mr, etc. 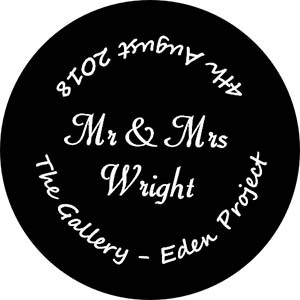 (married name) and the venue name and town for example: the wedding date: "day-month-year", "Mr and Mrs married name", "Venue name and town name" This is often the format we use but not always and it is based on your requirements. 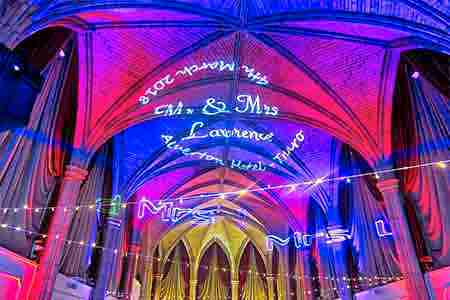 Our Gobo And Laser Projections Help Personalise Your Wedding. 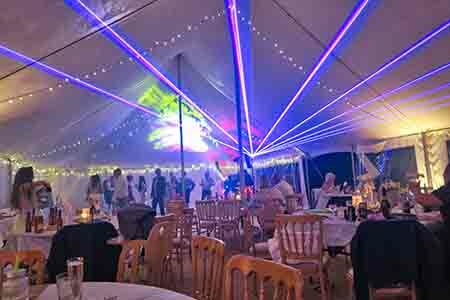 We use a very high power 60w LED gobo projector which is able to rotate the gobo either clockwise or counter clockwise, we can adjust the rotation speed from fast to slow or we can stop it so it does a static projection. We can also to some degree use your own images or text, but please bear in mind we offer this as a FREE add-on for a bit of unique WOW factor, each one does take us some time to make and there is a physical cost to us in making them. If you wanted something very specific, there would be a chargable fee, due to the time creating it, but we are happy to give you a quote based on your exact requirements. 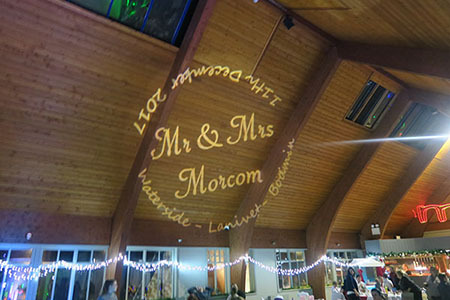 We are also able to provide customised laser projections, as part of our standard package we usually include at least one laser (venue dependant) as some venues are not suitable for lasers due to the low ceilings. We will often project a custom message on to a wall or ceiling, we can do either static images, animated images, patterns or what we usually do is text messages. For example: "Congratulations Mr and Mrs Evans", "Please welcome Mr and Mrs jackson to the dance floor for their first dance" and other similar type messages. The laser(s) also obvioulsy give off some amazing looking light beams so really you are getting two very special effects in one. Our lasers are a very high specification, they are top of the range units which produce a staggering 1.8 watts, they are analogue, pure diode lasers which mean they not only produce vivid primary colours they can also produce all the in-between colours, the whites, the oranges, the turqoises, the deep purples and thus look absolutely spectacular.